The 24-hour Thrash Test has been grueling. I am half awake, but it’s been a lot of fun getting so much track time. The SC8e RTR hasn’t skipped a beat in 18 1/2 hours. We’ve only had to replace a front bumper and one set of tires. The foam s in the tires were worn out and one completely fell apart. The Castle Creations Monster Mamba and Associated 2.4Ghz radio have worked flawlessly! 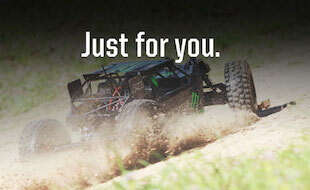 Associated will announce their SC8e RTR soon. The truck will feature a 2.4Ghz radio system as well as the Castle Creations Mamba Max Pro system we used for this test. The truck will be competitively priced. Stay tuned to see if the SC8e RTR can go 24-hours straight without any major malfunctions or repairs. 20-hours in and only a tire change and one front bumper are the fatalities. This truck and the Castle system are awesome!!!! 20-hours and the truck has traveled approximately 308 miles. 1-hour to go and the truck is holding up great. We’re averaging 25.25 seconds a lap including pit stops for battery changes. Your a class act Jason and thanks for answering all my questions at the track. You have extensive historical knowledge of RC which I found very insightful and useful. Thanks for sharing! Team Associated Team (Brent, Chris, and team). You answered all my questions and thanks for your kindness. Pretty impressive team, organization and truck! Keep up the good work. The SC8e RTR lasted the entire 24-hour test without any problems! The truck is absolutely bullet-proof and so was the Castle Creations Mamba Max Pro speed controller and the Associated XP digital servo. I still can’t believe we didn’t have anything let go. The truck only got about 30-seconds of rest during battery swaps, which were done every 20-minutes early on, but then switched to 15-minutes when the batteries wouldn’t last the entire 20-minutes. We only swapped out the radio battery twice. We used a Reedy 3000mah Lipo battery in the radio and it was never close to being fully drained. The ONLY broken or replaced parts. Look for the entire article in our Radio Control Electric Performance special issue. Thanks Allen, If you ever need any help with this hobby you’ll find a lot of great people that are willing to help! I am glad I was able to answer your questions. The guys from Associated are solid people and I had a lot of fun hanging out with Brent, Sean, Torrance, Cory, Rick, Jason and the rest of the gang that helped out. Robert Black, your track is sick (OCRC)! Thanks for showing us, especially RC Car Action, so much hospitality. You were aware of things most owners wouldn’t consider. Thanks again! You stated you used the Mamba max pro….is that a misprint or did you actually run that setup? It looks like they did use the Mamba Max Pro. In the pics of the overview of the truck you can clearly see the Mamba Mad Pro. what were the motor temps and speed control temps after 24 hours? the motor and esc didnt burn up? what was the gearing like? pretty sweet that an electric can run for that long. In the battery lead video it clearly shows a MMP (Mamba Max Pro) not the MMM (Mamba Monster Max) was used for the test. The motor temps were in the 115 to 140 degree range. The motor temps would jump some when a faster more aggressive driver was at the wheel. I believe Steven Hartson had the highest temps, but he also had the fastest lap times. Man that kid is a wheel. Yes, we used the Mamba Max Pro ESC. This ESC will be included with the SC8e RTR as well as Associated’s new 2.4Ghz radio system. Thanks for tuning in guys, we really appreciate it! We have more video that will be featured in the Radio Control Show and on this event page. how much will it be? and when will it be released thanks! How did you keep the motor and esc at a consistent temperature? Nice going guys. I’m very impressed!! If you gear the vehicle conservatively it should run for a very long time without any issues. Of course, binding and drivetrain issues can cause a malfunction with the ESC or motor, but we didn’t have any problems. We thought we might see a wire get pinched or worn, but that didn’t happen either. Pretty sweet Jason! Way to go guys. It’s awesome to see just how reliable (and fast) RC’s have become in recent years. Hi i see that you said a new SC8e RTR is coming out with the mamba max pro? Is this the reason the RC8e with the motor and esc got discontinued?..are they coming out with another one that includes the MMP? Hi it’s the same person as the post above..
Just woundering also what motor you guys were running? I don’t know why the RC8e was discontinued. I know that the Mamba Max did great and was plenty fast. Maybe Associated has plans to do more with the system in other vehicles. We used the 1800KV motor and it had plenty of rip and never got above 140 degrees. Ok…it’s the same person as above again lol..what were you running for batteries with the mmpro and what was the gearing? And was it the Neu/castle 1800kv one?..like the 1512 1.5Y? We ran Reedy 5000mah 4S lipo packs. I am not sure exactly about the gearing. I will have to check with Team Associated. All of the info will be in the article I’m writing, which will be featured in our Radio Control Electric Performance special issue. The magazine should be on sale within a month or so.